Belgium Blog - This local blog is a blog devoted to discovering Belgium with Google Earth (according to its author Pascal Laureyn who contacted me by E-mail). He also works with GeoBrussel which is focused on Brussels. S/V Sandpiper - a blog about the sailing voyages of the sailing vessel Sanpiper. Ron Larson (brother of the skipper) keeps up this well-done blog and a Google Earth file showing where Sandpiper has been/is/plans to go. 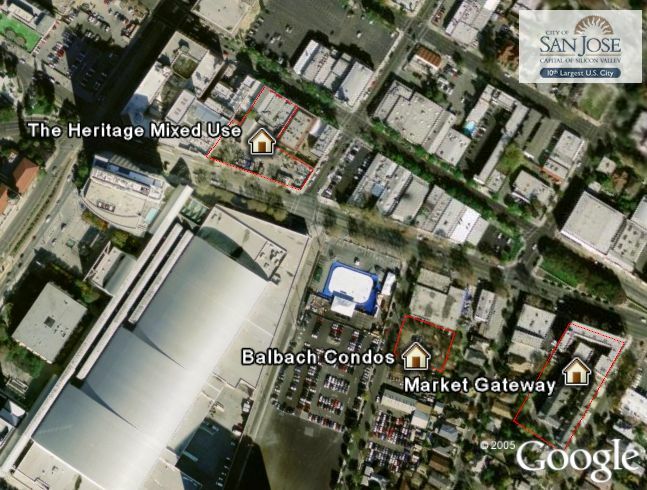 Smart Growth Projects - For the City of San Jose. I was asked to give some tips on this collection of placemarks by Greg Rose. Included are not only placemarks, but also outlines of the properties. PlayGoogleEarth.com - a web site placeholder showing that this game/site will launch in 37 days "or less". Air Fares in Google Earth - I wrote about this slick airfare calculator last December. They now support more than just the US. If you visit their web site farecompare.com, it first calculates fares based on where it thinks your IP address is located. Then, select a region of the world you want to travel to and it will show you a google maps view of fares. If you click on the Google Earth icon above the map it will show you the same info in GE. Or you can try it right now for fares in the US.